Several low-rise buildings in the middle of the block have been bought by Gary Barnett, who plans a tower. 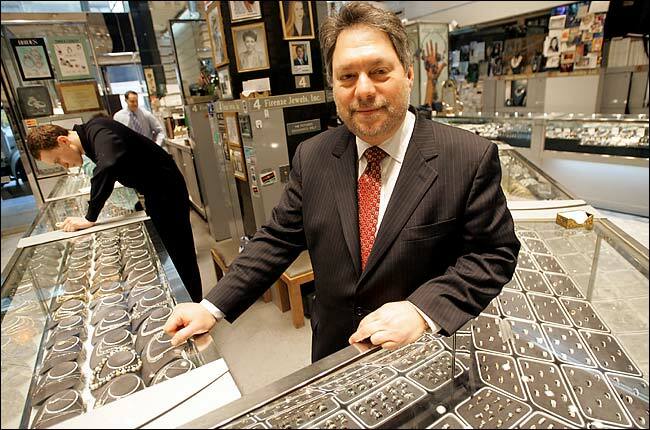 Jeffrey Levin, the chairman of the area's business improvement district and the owner of Firenze Jewels, is afraid of a large building's effects. Gary Barnett has come a long way since he got his start as a diamond merchant two decades ago in Antwerp. He came to New York in the early 1990's, got into real estate, and runs a business that has seven major projects in Manhattan. But now, his plans for an eighth project — a 30-story global diamond exchange in the heart of the city's diamond district — have some there charging that he is undermining their well-being and betraying his roots. A number of the landlords and diamond sellers on West 47th Street, where brokers' pockets are filled with tissue-wrapped diamonds worth hundreds of thousands of dollars and deals are still sealed with a handshake, have taken to the barricades to stop him. They fear that Mr. Barnett's tower will steal all the best tenants and leave the rest of the 60-year-old district a "ghost town," if he is successful in lobbying the city for tax breaks and other incentives. Mr. Barnett, known in Belgium as Gershon Barnett, has asked the city for a substantial subsidy package for a state-of-the-art building that would house retailers, wholesalers, jewelry makers, diamond cutters, mining companies, shippers, banks, their safes and a high-security garage. He says the building could help reinvigorate the dowdy, low-scale block between Fifth Avenue and Avenue of the Americas, an important international diamond center that is under siege from low-cost producers, Internet sales, suburban diamond exchanges, Wal-Mart and Costco. With the flow of cheaper diamonds from India and now China, hundreds of the cutters and polishers who worked in the small rooms above the diamond and jewelry arcades that line 47th Street have left New York or retired over the past 20 years. New York remains a distribution center, because 90 percent of the diamonds that come into the United States — about half the diamonds sold in the world — flow through 47th Street. But, Mr. Barnett contends, New York's diamond district will almost certainly continue to lose ground unless something is done. "The diamond and jewelry industry needs a center," said Mr. Barnett, 50, a dark-haired man who favors white shirts sans ties. "There have been several diamond buildings. But there's nothing brand-new, modern." He says that New York needs the kind of government-supported central diamond exchanges that have been built in Shanghai, Tel Aviv and now Dubai. Over the past four years, Mr. Barnett has acquired 10 five-story buildings midblock, on the south side of 47th Street and the north side of 46th Street. Tenants have been notified that demolition should start in May or June. But Mr. Barnett has run into opposition from the 47th Street Business Improvement District, local landlords and some retailers. They say that diamond manufacturing will never come back to New York from India and China. Further, they say that Mr. Barnett's tower will upset the delicate ecosystem that exists on the street if he gets municipal tax breaks that give him an unfair advantage. "The city's not really giving abatements to anybody," said Jeffrey Levin, the chairman of the business improvement district and the owner of Firenze Jewels. "I'm afraid of the district disappearing. He's trying to rob the other buildings of their tenants. It could become a ghost town." The block is a rare low-slung respite of mostly five-story buildings amid Midtown skyscrapers. At street level, there are more than two dozen exchanges or arcades comprising dozens of separate booths, with the best-known getting the coveted window spots. If Mr. Barnett's subsidized tower pulls in all the best tenants, critics contend that the rest will follow, at the expense of the district as a whole. Kenneth Kahn, an owner of what is now the premier diamond building, 580 Fifth Avenue, near 47th Street, said that Mr. Barnett's representatives have already approached 170 tenants in his building, including the industry's cornerstones: the Diamond Dealers Club, a major international bourse, and the Gemological Institute of America. Basant Johari, president of Kuber Manufacturing and a director of the Diamond Club, said the club had received a very attractive offer. "Mr. Barnett planned to build a building for the industry that would bring in business from overseas," Mr. Kahn said. "But that's just not possible. All he's done is go around poaching tenants from other buildings. If the city wants to give benefits, give them to the whole block and enable the entire industry to benefit." Mr. Kahn has hired a lobbyist, Fran Reiter, a former deputy mayor in the Giuliani administration, to offset Mr. Barnett and his lobbyist, Suri Kasirer. Mr. Barnett has met several times with city officials to discuss the project, and he has invited Deputy Mayor Daniel L. Doctoroff to lunch at the Diamond Dealers Club. But so far, no deal has been struck. "We want to make sure that if we provide incentives, the project will create new jobs, not just cannibalize existing jobs," said Andrew M. Alper, president of the city's Economic Development Corporation. There is no question that the diamond district is in a state of flux. It is one of the few remaining industrial and commercial centers that could once be found in disparate corners of Manhattan. There is little left today of the flower, fur, printer and garment districts, but the diamond district remains, although with a different focus. Like New York itself, the diamond and jewelry district started downtown, at Nassau and Fulton Streets, before migrating up to the Bowery near Canal. By 1940, it began the leap northward to 47th Street. At the same time, Jews fleeing the diamond centers in Antwerp and Amsterdam landed in New York, bringing an entrepreneurial flair and an expertise in cutting and polishing. Large, expensive diamonds — say, 3, 4, and 5 carats — are still cut and polished on 47th Street, but manufacturing has for the most part moved on. The number of diamond cutters has declined to about 300, from roughly 3,000 15 years ago, according to Martin Rapaport, publisher of the Rapaport Diamond Report. The reason is simple economics. If it costs $110 to cut a one-carat diamond in New York and $65 or more in Tel Aviv, it can be done in India, where there are a million people involved in the industry, for as little as $10, Mr. Rapaport said. "Forty-seventh Street has made a huge transition from a diamond manufacturing center to a diamond trading center," Mr. Rapaport said. "The profit is in selling the diamonds. The key now is to make the transition from a secretive diamond cutter guild to being a marketing and branding center for high-value diamonds." Before coming to New York, Mr. Barnett worked as a diamond merchant in Antwerp in the 1980's for S. Muller & Sons, a prestigious diamond house owned by his wife's family. With the help of what he described as "European investors," he moved to New York and plunged into the real estate business. Today, he is chairman of Extell Development Company and is running seven projects in Manhattan, including the nearly completed 60-story Orion condominium on West 42nd Street, the conversion of the Stanhope Hotel on Fifth Avenue into luxury apartments and the construction of a pair of towers called the Ariel East and West on Broadway near 100th Street. But the 47th Street project provides a connection to his roots. He said the project was about preserving "added-value jobs" in diamond polishing, jewelry and preserving 47th Street's position as an international trading center for high-quality diamonds, not about trying to revive diamond manufacturing. "Some of the landlords are running scared," he said, "after 30 years of neglecting properties and not dealing with their tenants' and the industry's needs. With the exception of two or three landlords, this building is good for the industry." I hope that the Diamond Center building on the northeast corner of 47th and 6th is razed. It's disgusting, for sale and would be a great site for a hotel. While most of 47th Street is filthy and disausting, there are some beautiful buildings on that street which simply need to be cleaned. I hope that Gershon doesn't raze them and leave crap standing. Anyway, I wonder if old Gershon Barnett is in the Russian or Israeli mob. He has loads of money and came out of nowhere. Last edited by londonlawyer; March 13th, 2006 at 12:51 AM. I myself have never undertood the lure of diamonds, but clearly I'm in the minority. Tax breaks / abatements / incentives for this project would be highly questionable. Thanks to the many activists who joined forces on September 18 to find out what diamond retailers are doing (or not doing) to combat the trade in conflict diamonds. The day was a huge success - in 50 cities across 18 states, AI activists visited 246 stores to conduct the survey and raised awareness among consumers by tabling and leafleting in their communities. Only 27% of shops were able assure us that they had a policy on conflict diamonds. 30% of the shops that said they had a policy were unable to produce a hard copy of or explain it. Only 13% of shops provided warranties to their customers as a standard practice. 37% of the shops we visited claimed to be aware of the conflict diamonds issue. But 54% of them reported an inaccurate definition of the crisis. Only 28% of the shops were aware of the Kimberley Process. 29% of those who were aware of the Kimberley Process had only a minimal or limited understanding of it. When asked whether consumers inquired about conflict diamonds, 83% of respondents answered rarely or never. 110 shops refused outright to take the survey. The survey results indicate that jewelers are still keeping consumers in the dark when it comes to their policies to keep conflict diamonds out of stores. Even before 9/11, the diamond merchants were getting nervous. Media and human rights groups began exposing the complicity of the romance industry in fueling wars. They also challenged the notion that Sierra Leone was simply another isolated post-cold war conflict that was troubling in its brutality but irrelevant to the national interests of developed countries. Despite many meetings, the panel failed to reach a consensus on how to end the trade in blood diamonds. The U.S. Congress, too, faced intense lobbying. In 2000, Rep. Tony Hall (D-Ohio) introduced the Clean Diamond Act, a bill that sought to enact into law whatever import and export controls the Kimberley Process would adopt. The bill languished because of serious concerns over provisions added at the request of the Bush administration that—according to NGOs, the industry, and some senators— fatally compromised the bill. The 9/11 terrorist attacks, along with a blistering Washington Post investigation by Doug Farrah into Al Qaeda's large purchases of Sierra Leone diamonds, raised the stakes. While associating with bloodthirsty rebels was a formidable PR challenge for the diamond industry, funding the terrorists who attacked the U.S. was simply unspinnable. Last November, the Kimberley Process agreed to a set of regulations that would require that all cross-border diamond transactions be accompanied by a non-forgeable paper trail, indicating when and where every imported stone was discovered. The Clean Diamond Act followed suit and was passed by the House of Representatives 408- 6. It is currently awaiting a vote in the Senate. Unfortunately, neither action is halting the lucrative trade: “Efforts to end the trade in conflict diamonds ran into a major obstacle in the Bush administration, which has been reluctant to impede business in any way or have its hands tied by any international agreements, even when the U.S. diamond industry has called for it,” says Akwei. Those buildings are hideous eyesores. I will be pleased to see them razed. 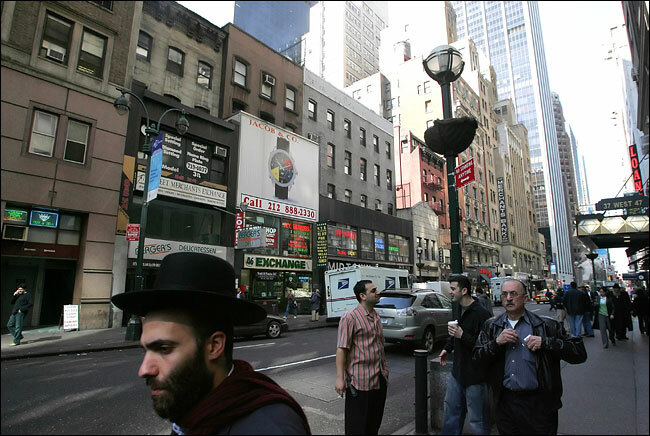 With respect to the infiltration of Israeli and Russian mobs in the Diamond District, does anyone recall a few years ago when a Russian who was to testify against other mobsters was executed right on 47th Street? ^ was it this story? A Bronx man with a long criminal record was identified by several witnesses yesterday as the gunman who calmly walked up behind a diamond merchant at dusk on a crowded Midtown street last spring and shot him in the back of the head, law enforcement officials said. The killing of the diamond merchant, Eduard Nektalov, who when he was slain was under federal indictment along with his father in an international money laundering case, had all the hallmarks of a contract killing and has stymied detectives for nearly a year. But in the last few days, evidence from a seemingly random shooting on a Bronx street last Aug. 30 linked the Bronx man, Carlos Fortier, 36, to the Nektalov killing, several law enforcement officials said. Detectives from the Midtown North Precinct Detective Squad and the Manhattan South Homicide Task Force are working on the theory that Mr. Fortier, who is dying of AIDS, was paid to kill Mr. Nektalov, the officials said. The evidence that led investigators to Mr. Fortier, the officials said, was several spent .45-caliber shell casings found after the Aug. 30 shooting at 152nd Street and Tinton Avenue in the Melrose section of the Bronx, the officials said. Recent test results showed that the shell casings matched those found on Sixth Avenue between West 47th and West 48th Streets in the diamond district after Mr. Nektalov, 46, was fatally shot on May 21, 2004, and the description of the gunman provided by witnesses matched that of Mr. Fortier, the officials said. At the Midtown North Precinct station house yesterday, several witnesses to the diamond district shooting identified Mr. Fortier as the gunman. No charges were filed against Mr. Fortier, who is undergoing treatment at Bellevue Hospital Center, but prosecutors from the office of Manhattan District Attorney Robert M. Morgenthau said they expect to present evidence in the case to a grand jury next week. No one was injured in the Bronx shooting, in which Mr. Fortier was accused of firing into a crowd and fleeing, the police said. When he was arrested a short while later on attempted murder, attempted assault and other charges, he denied firing the shots and no gun was recovered, according to court papers. Kaelin Akohonae, a lawyer who represents Mr. Fortier in the Bronx case, did not return a telephone call seeking comment. Mr. Nektalov was killed after he had walked about 80 paces from the door of his family's shop, Roman Jewelers, at 74 West 47th Street, turning north onto Sixth Avenue on his way to the West 48th Street garage where he parked his Bentley. The gunman, described as an olive-skinned man with long hair, fell in behind him on the crowded sidewalk, approached from behind and fired. One bullet struck Mr. Nektalov in the back of the head and two others hit him in the back after he fell to the ground, the police said. He died on the sidewalk in front of a Gap store. Mr. Nektalov, according to a federal indictment that later led to his father's conviction on money laundering charges, helped sell diamonds and gold to undercover agents posing as Colombian drug dealers, and forged gold into the shape of nuts and bolts and other household items to facilitate its shipment to Colombia. In the days after the killing, investigators focused on the possibility that someone may have believed that Mr. Nektalov was planning to plead guilty and become a government witnesses, a theory that his lawyer, Christopher E. Chang, dismissed. They also were examining the theory that he was killed after someone asked him to intervene in a shooting in December 2003 involving one of his cousins, the police said. He had been asked to persuade the cousin to drop the charges, but the young man went forward with the case. Yesterday, one law enforcement official suggested that investigators were hopeful that Mr. Fortier would provide information to the authorities because he is so ill.
At the time of his arrest in the Bronx shooting, according to court papers that include part of a transcript of his videotaped statement to a prosecutor, he acknowledged crimes he had committed in years past, but was adamant in denying that he had played any part in the attack on East 152nd Street. Mr. Nektalov (victim) , according to a federal indictment that later led to his father's conviction on money laundering charges, helped sell diamonds and gold to undercover agents posing as Colombian drug dealers, and forged gold into the shape of nuts and bolts and other household items to facilitate its shipment to Colombia. has Gershon Barnett ever deveopet an office building? they mainly do condo development. I'm sure that Kipp will develop that corner. He's probably trying to acquire more properties. and i heard that that is holding up the deal. I found it. It looks nice. Is this the one? I count 34 floors.